Masses of creamy yellow daisy flowers all summer long. A new introduction bred to perform really well in your garden and are ideal when grown in containers. Smothered in creamy yellow daisy flowers with a darker, caramel-coloured 'eye'. Blooms all summer and into autumn, filling your garden with dazzling, semi-double flowers. Really easy to grow and ideal for beginner gardeners, they're good for wildlife too - a Mecca for butterflies and other pollinators. Plants will grow to a height of around 40cm and are supplied as 12 x plug plants ready for potting up and growing on or planting straight out. A new introduction planned for 2019, which we heave sneaked a few plants of a year early - a worthy plant for your borders and pots this year, these bedding plants have been bred to perform outstandingly in your garden, especially when grown in containers. 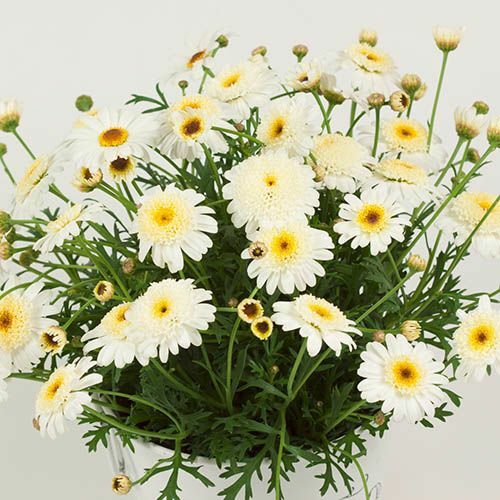 Smothered in creamy yellow flowers, with a darker, caramel coloured 'eye', this Marguerite Daisy will flower its little heart out all summer and into autumn, filling your garden with dazzling, semi-double blooms. Really easy to grow and ideal for beginner gardeners, the compact plants are well branched, meaning that you'll get plenty of flowers. Good for wildlife too as each daisy is held above the finely divided, feathery leaves, making them stand out even more, creating a Mecca for butterflies and other pollinators. Plants will grow to a height of around 40cm and are supplied as 12 x plug plants ready for potting up and growing on once all risk of frost has passed. Supplied as 12 x plug plants, ready to be potted up and grown on or planted stright out once all risk of frost has passed. Marguerites have a long flowering season, from May until November, so benefit from regular deadheading to remove faded blooms. A light all-over trim after each major flower flush will encourage new growth and more flowers. Plant in fertile, moist free-draining soil in full sun to partial shade in a sheltered position and keep well-watered throughout the summer. Alternatively, plant in pots or baskets in a good multi-purpose compost. While deadheading is not essential, regularly removing spent flowers will encourage further growth and result in more flowers for longer.